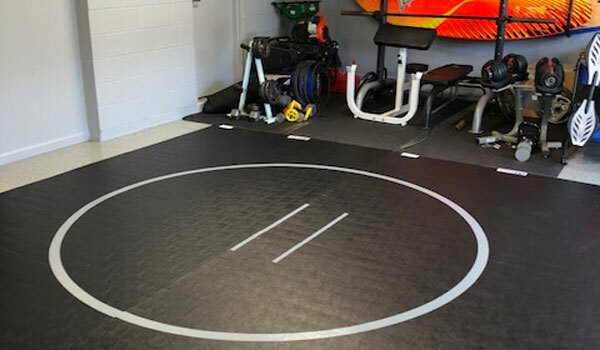 10' x 10' x 1-1/4" 12' x 12' x 1-5/8" 18' x 18' x 1-5/8"
Description - Deluxe Home Wrestling Mats are the perfect athletic flooring solution for the wrestler looking to enhance their skills with a durable at home practice space. These durable yet lightweight mats can easy be rolled out for use and rolled back up for storage when in between practice sessions. The tough 24oz vinyl top surface features a standard circle as well as starting lines to allow for practice within regulations. The durable vinyl surface is also easy to clean with the quick wipe of a cloth or even a light sweep to remove dust and debris. Shock absorbing and portable, these wrestling mats are perfect for practicing in any room of the home, indoors, and even outdoors. Material – Crosslink Polyethylene Foam bonded to a Tough 24 oz. Vinyl top. 10' x 10': Includes two 5’ x 10’ mats, one roll of mat tape, gray 8' circle & starting lines. 12' x 12': Includes two 6’ x 12’ mats, one roll of mat tape, gray 8' circle & starting lines. 18' x 18': Includes three 6’ x 18’ mats, one roll of mat tape, gray 10' circle & starting lines. Thickness – 1-1/4” and 1-5/8" thicknesses. Weight – 10' x 10' mats weigh ~46 lbs total, 12' x 12' mats weigh ~62 lbs total, and 18' x 18' mats weigh ~150 lbs total. Recommended Uses – Deluxe Home Wrestling Mats are great for home wrestling practice in the basement, garage, inside, and even outdoors. Our large Home Wrestling Mats can also be used as matting for cheerleading, MMA, gymnastics, tumbling, and much more. Lightweight and portable home wrestling mat. Safe and durable home wresting mat. 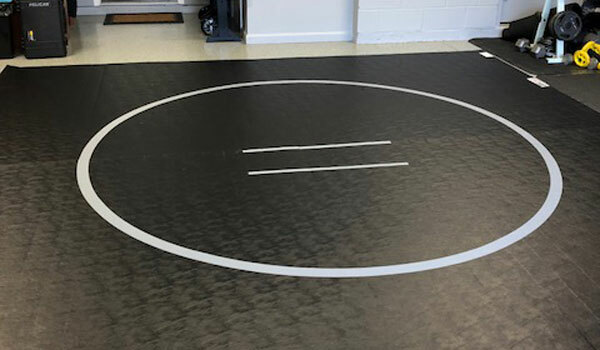 Do you wrestling mats meet or exceed STM F1081 wrestling mat impact standard in accordance with ASTM F355 "Test Method for Shock Absorbing Properties of Playing Surface Systems and Materials? Our Deluxe Home Wrestling Mats do meet and exceed both standards. Where are your mats made? Where is the foam made? Our Deluxe Home Wrestling Mats are made from Crosslink Polyethylene Foam bonded to a 24 oz. vinyl top. I bought them to practice wrestling with my boys but today I did burpees on the mats during my workout. I also figure my girls can practice their cheer stunts and flips on the mats.